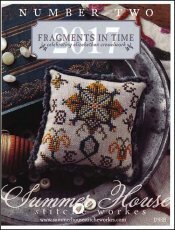 Fragments In Time 2017 Part 2 [C6820] - $5.00 : Yarn Tree, Your wholesale source for cross stitch supplies. Cross stitch pattern from Summer House Stitche Workes. Look what has sprouted up from the ground! A splendid flower stitched in colors of yellow, blue, green & brown. My oh my, what a beautiful design! Stitch count is 49W x 50H. Stitched on #5027 Zweigart Belfast Linen 32ct. Platinum. Chenille Trim: #2287 Thunder Cloud Cotton Chenille from Lady Dot Creates.